For cat owners, the question of whether to keep their pets indoors or let them roam free throughout the neighborhood like their feline ancestors is a highly-charged debate. Many choose to let their cats experience the “wild” life, by giving them access to the great outdoors, be it city or rural. Others decide that their pets will be safer and happier inside: away from cars, disease, and larger animals. Myths about cats that have perpetuated throughout the years only add confusion to this tough question. Myth: Cats are self-sufficient creatures and able to fend for themselves. Myth: “Confining” a cat indoors is a form of animal cruelty. Myth: The wild is the natural habitat of the domestic cat. While cats are very independent creatures (that’s one of the things we love about them), it is difficult for a 10-pound animal to defend himself against the threat of a speeding SUV or dangerous illnesses. In addition, while it could be cruel to pen a large cat, like a tiger or lion, which is used to hunting dinner on the plains of Africa, housecats were domesticated centuries ago and no longer require the outdoors to be happy: they depend on us for food and shelter. Boutique Kittens encourages cat owners to opt for the indoors. Your cat can live a safe, happy and fulfilling life without ever having to experience the fear and danger that many outdoor cats are exposed to daily, especially if your cat is very young and has never been outside. If you are concerned that your cat will become bored or depressed if deprived of the excitement that is involved with day-to-day survival, there are many ways that you can make the “easy” life attractive to your pet. 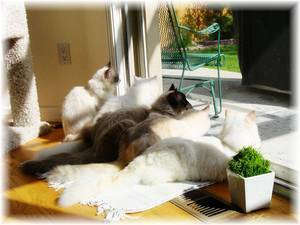 You don’t need to extensively remodel your house to ensure that it is as appealing to your cat as possible, but there are several easy and inexpensive ways to make a “people” house cat-friendly. A happy cat is one whose basic needs are addressed. Make sure that your pet has easy access to a clean litter box, fresh water, and food. With the proper diet, regular vet checkups and vaccinations, your indoor cat should have a much longer life expectancy than an outdoor cat; indoor cats can live from 12 to 20 years, while outdoor cats may only survive from one to five years. Your cat needs your love and affection to remain happy indoors. Try to spend around a half-hour with your cat, twice a day, just cuddling, playing and being together, and you and your cat will both reap the benefits. Regular playtime and exercise are essential to keeping your pet healthy and happy. Keep a scratching post and a variety of toys available to your pet. Rotate the toys regularly to avoid boredom, and remember, not all things that amuse your cat are expensive pet store purchases. A small catnip mouse inside a paper grocery bag can provide a lot of enjoyment. Don’t let curiosity be your cat’s demise. Cats are notoriously agile and can get into cupboards, so if you store hazardous cleaners under your sink, consider child safety locks as an inexpensive solution. In addition, make sure the screens on your windows are sturdy, especially if your cat has a tendency to soak up sun on the sill. This will prevent accidental falls and forays into the wild. Poisonous houseplants should also be kept out of reach. Cats enjoy looking down from lofty perches, as you can attest to if you’ve ever caught yours staring down at you from a bookcase or entertainment stand. 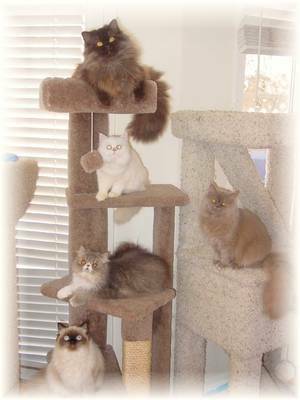 A carpeted cat tree is a great home accessory that will serve as a source of entertainment and exercise for your pet, as well as a superior vantage point. Cats enjoy grazing once in a while to settle upset stomachs, pass troublesome hairballs, or just get an extra dose of vitamins and minerals. To save your houseplants, pick up a “cat grass” kit at a pet store. Wait until the grass shoots are about two inches tall, and then offer your cat a green snack. If he or she mows it all down and vomits afterward, only allow a few minutes of grazing at a time. If you have a cat that has been outdoors for months or even years, you can still convert him or her into a happy indoor cat. However, to avoid having your pet yowl to get out constantly, scratch at doors and window screens, or just generally be miserable, you’ll want to plan out the shift as carefully as possible. Winter is a great time to make the transition, as cats, being smart creatures, want to avoid the cold. Begin by feeding your pet indoors. While he or she is inside, introduce them to the litter box. Don’t force them to stay indoors for long periods of time, especially if it seems to make them uncomfortable, but let your cat back out when he or she is done eating and exploring. Each time you bring your cat indoors to be fed, extend the time before you let them back out. Eventually, you can stop letting your cat back outside altogether. Make sure to compensate for the loss of the great outdoors with lots of love and attention, and your cat should be happy to give up the dangerous and unsure outdoor way of life for one of safety and security. If you have a young cat, try training them to a leash and harness. 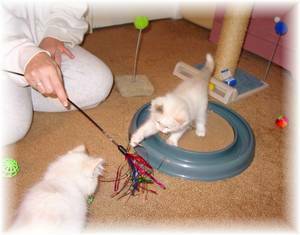 Cats, being just as smart as dogs and ferrets, can be trained to a leash, but as with training any pet, younger is better. 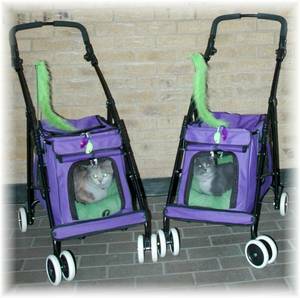 Special enclosed strollers are also available for cats and small dogs, but be prepared if you choose this route: you will receive a lot of attention from people who are curious about your kennel on wheels. If you can accustom your cat to being leashed or carried in a stroller, outdoor walks or time spent in the backyard become another way to spend quality time together. You can also buy a cat enclosure for your yard, or build one if you’re handy with a hammer and nails. 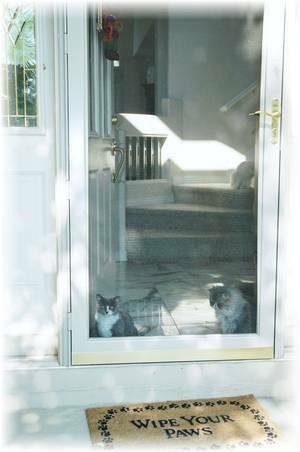 Cat enclosures, whether made of wood and wire or nylon and mesh, are a great way for your cat to experience the sights, smells and sounds of the outdoors in a safe way. As cat owners, it’s our responsibility to provide for our cats as best we can. Cats kept indoors typically live longer, safer and happier lives than their outdoor counterparts, with the added benefit of loving human companionship. Should you declaw your indoor kitty? Visit our information page on the Declaw Debate.